Can�t seem to get enough of the scrumptious taste of toasted marshmallow shaved ice and snow cone syrup? No problem! 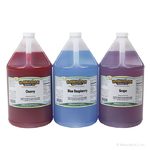 Whether you�re throwing a party, or stocking up your shelves at your shaved ice shop, purchase this glorious, gallon-size container of syrup, and you�ll surely have a sufficient supply for service. 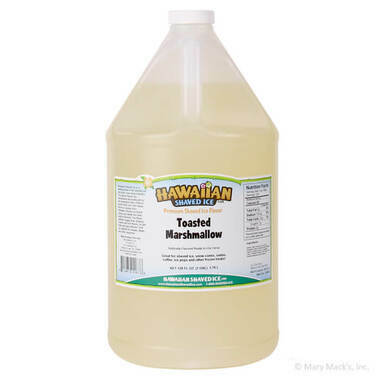 When you drizzle a touch of toasted marshmallow syrup over your shaved ice, you will be treated to the delectable, delightful flavor of fluffy toasted marshmallows, so you�ll feel just like you�re chomping on the real confection! This fun flavor will be a consistent crowd-pleaser at any occasion, from the family reunion to the company picnic to the kids� sleepover. Our toasted marshmallow shaved ice and snow cone syrup is conveniently available in quart-size and gallon-size containers, so please try some for yourself today only at Hawaiian Shaved Ice!